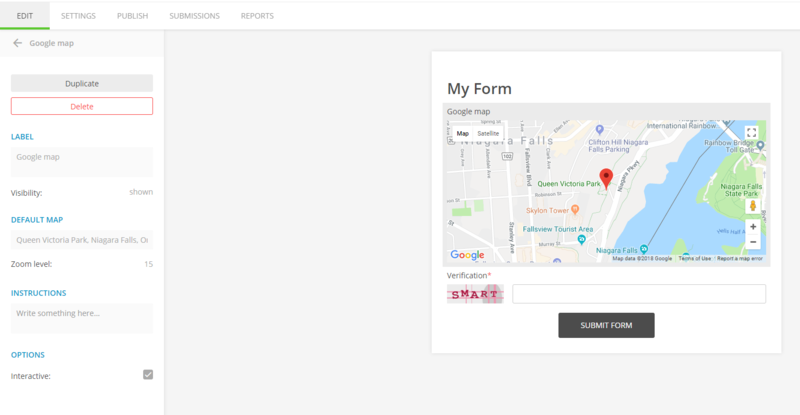 Yes, you can add a Google interactive map to your web form. In the Form Editor, you will find the Google map field in the Other Fields section of the Add Field panel on the left. Drag and drop it on the form, next select it and go to Edit Field where you can customize the map. In the Default Map field, type in the address of a location and you will be able to see the changes on the map instantly. A marker will be displayed on the map. The Google map is interactive only in preview/view mode, and of course, in the customization lightbox. By default, the map is set as interactive, meaning that users can navigate through the map and also view the map in the satellite mode. You can also adjust the zoom level and set it between 1-20 pixels. If you don’t require the Google interactive map, but a static Google map, return to it’s Edit panel and uncheck the option Interactive map. Map doesn’t show up on forms though it use to and it shows up in the form before it’s published…. If I’ve understood correctly, you say the Google map shows up in the editor, but not in the preview/view mode? Could you give us some more details such as the browser and operating system that you are using and send them to our Support Team at support@123formbuilder.com? They will offer you all the properly assistance that you need. The map no longer shows on our reservation form? It’s the first item on our form. I’ve deleted and added it again – but the website only shows a blank area? It used to work just fine. I’m using a Wix website and did save as that feature. Also, if you could provide us with a screenshot, we’d appreciate the effort, as it would help us to better understand your scenario.